For other uses, see Voyageur (disambiguation). The voyageurs (French: [vwajaʒœʁ] ( listen), travelers) were French Canadians who engaged in the transporting of furs by canoe during the fur trade years. The emblematic meaning of the term applies to places (New France, including the Pays d'en Haut and the Pays des Illinois) and times (primarily in the 18th and early 19th centuries) where transportation of materials was mainly over long distances. Despite the fame surrounding the voyageur, their life was one of toil and not nearly as glorious as folk tales make it out to be. For example, they had to be able to carry two 90-pound (41 kg) bundles of fur over portage. Some carried up to four or five, and there is a report of a voyageur carrying seven for half of a mile. Hernias were common and frequently caused death. Most voyageurs would start working when they were twenty-two and they would continue working until they were in their sixties. They never made enough money to consider an early retirement from what was a physically grueling lifestyle. The major and challenging task of the fur trading business was done by canoe and largely by French Canadians. The term in its fur trade context also applied, at a lesser extent, to other fur trading activities. Being a voyageur also included being a part of a licensed, organized effort, one of the distinctions that set them apart from the coureurs des bois. Additionally, they were set apart from engagés, who were much smaller merchants and general laborers. Mostly immigrants, engagés were men who were obliged to go anywhere and do anything their masters told them as long as their indentureship was still in place. Until their contract expired, engagés were at the full servitude of their master, which was most often a voyageur. Less than fifty percent of engagés whose contracts ended chose to remain in New France (either because the others returned to France or because they died while working and never had a chance to leave). Europeans mainly traded alongside the coast of North America with Native Americans. The early fur trade with Native Americans, which developed alongside the coasts of North America, was not limited to the beaver. Beavers were not particularly valued and people preferred "fancy fur" or "fur that is used with or on the pelt. The fur trade was viewed as secondary to fishing during this era. 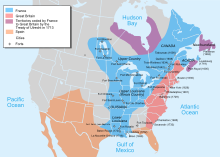 The earliest North American fur trading did not include long distance transportation of the furs after they were obtained by trade with the First Nations; it started with trading near settlements or along the coast or waterways accessible by ship. Soon, coureurs des bois achieved business advantages by travelling deeper into the wilderness and trading there. 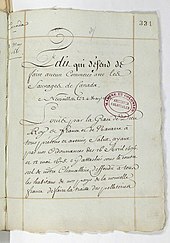 By 1681, the King of France decided to control the traders by publishing an edict that banned fur and pelt trading in New France. Also, as the trading process moved deeper into the wilderness, transportation of the furs (and the products to be traded for furs) became a larger part of the fur trading business process. The authorities began a process of issuing permits (congés). Those travellers associated with the canoe transportation part of the licensed endeavour became known as voyageurs, a term which literally means "traveler" in French. The fur trade was thus controlled by a small number of Montreal merchants. New France also began a policy of expansion in an attempt to dominate the trade. French influence extended west, north, and south. Forts and trading posts were built with the help of explorers and traders. Treaties were negotiated with native groups, and fur trading became very profitable and organized. The system became complex, and the voyageurs, many of whom had been independent traders, slowly became hired laborers. By the late 1600s, a trade route through and beyond the Great lakes had been opened. The Hudson's Bay Company opened in 1670. The North West Company opened in 1784, exploring as far west and north as Lake Athabasca. The American Fur Company, owned and operated by John Jacob Astor was founded in 1808. This company, by 1830, grew to monopolize and control the American fur industry. In the late 1700s, demand in Europe grew substantially for marten, otter, lynx, mink and especially beaver furs, expanding the trade, and adding thousands to the ranks of voyageurs. From the beginning of the fur trade in the 1680s until the late 1870s, the voyageurs were the blue-collar workers of the Montreal fur trade. At their height in the 1810s, they numbered as many as three thousand. For the most part, voyageurs were the crews hired to man the canoes that carried trade goods and supplies to trading locations where they were exchanged for furs, and "rendezvous posts" (example: Grand Portage). They then transported the furs back to Lachine near Montreal, and later also to points on the route to Hudson Bay. Some voyageurs stayed in the back country over the winter and transported the trade goods from the posts to farther-away French outposts. These men were known as the hivernants (winterers). They also helped negotiate trade in native villages. In the spring they would carry furs from these remote outposts back to the rendezvous posts. Voyageurs also served as guides for explorers (such as Pierre La Vérendrye). The majority of these canoe men were French Canadian; they were usually from Island of Montreal or seigneuries and parishes along or near the St. Lawrence River; many others were from France. Voyageurs were mostly illiterate and therefore did not leave many written documents. The only known document left behind for posterity by a voyageur was penned by John Mongle who belonged to the parish of Maskinonge. He most likely used the services of a clerk to send letters to his wife. These chronicle his voyages into mainland territories in quest of furs. There were three major influences that molded the lives of voyageurs. Firstly, their background of French-Canadian heritage as farmers featured prominently in their jobs as voyageurs. The latter was seen as a temporary means of earning additional income to support their families and expand their farms. Most voyageurs were born in New France. However, fur trading was not an everyday experience for most of the colonial population. Roughly two thirds of the population did not have any involvement in the fur trade. The second influence came from the Native communities. By experiencing the same conditions as the Natives and interacting with them, the voyageurs learned that using the same clothing and tools as them, they could make the most of their environment. Although this influence worked both ways; the Natives coveted certain objects which they received in trade with the voyageurs. The final influence was the social structure of the voyageurs life. Since this group included only men, it embodied masculinity itself. These men engaged in activities such as gambling, drinking, fighting; interests which were reserved for men of this trade. These two terms have had broad and overlapping uses but their meanings in the context of the fur trade business were more distinct. Voyageurs were the canoe transportation workers in organized, licensed long-distance transportation of furs and trade goods in the interior of the continent. Coureurs des bois were entrepreneur woodsman engaged in all aspects of fur trading rather than being focused on just the transportation of fur trade goods. 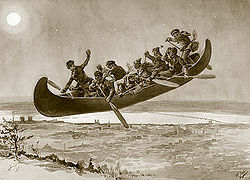 The coureurs des bois' zenith preceded the voyageur era, and voyageurs partially replaced them. For those coureurs des bois who continued, the term picked up the additional meaning of "unlicensed". Another name sometimes given to voyageurs is engagés, indicating that one is a wage-earning canoeman. There were several types of voyageurs and this depended on the job that they were skilled to carry out. Voyageurs who paddled only between Montreal and Grand Portage were known as mangeurs de lard (pork eaters) because of their diet, much of which consisted of salt pork. This was considered to be a derogatory term. These men were seasonal workers employed mostly during the summer months who used canoes to transport their goods which could weigh as much as four tonnes. It was necessary to have up to ten men to safely navigate with so much on board. They would travel to the western end of Lake Superior to drop off their goods. Those who overwintered were called hommes du nord (northern men) or hivernants (winterers). Those who were neither primarily travelled the interior (beyond Grand Portage) without wintering in it. They would pick up the goods from Lake Superior and transport them inland over large distances. Because of their experience, approximately one-third of the mangeurs de lard would become hommes du nord. After the British conquered Canada in 1763, management of the Montreal trade was taken over by English-speakers while the trapping and physical labour continued to be accomplished by French Canadians. 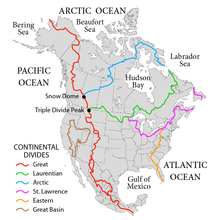 The Montreal-based North West Company was formed in 1779 largely because distances had become so great as to require a highly organized transport system (The Athabasca country was 3000 miles from Montreal and a canoe might go 1000 miles in a month). The independent coureurs des bois continued to be replaced by hired voyageurs. Since the west country was too far for a round trip in one season, each spring, when the ice broke up, boats would set out from Montreal while winterers would start east. They exchanged their goods at Grand Portage on Lake Superior and returned before the rivers froze five months later. To save the cost of hauling food from Montreal Métis around Winnipeg began the large-scale production of pemmican. The Hudson Bay trade was diverted southwest to the edge of the prairie where pemmican was picked up to feed the voyageurs on their journey northwest to the Athabasca country. Competition from the Nor'Westers forced the Hudson's Bay Company to build posts in the interior. The two companies competed for a while and, in 1821, merged. Management was taken over by the capital-rich HBC, but trading methods were those of the Montreal-based Nor'Westers. After the merger of the North West Company and the Hudson's Bay Company much trade shifted to York Factory (the Hudson Bay route) and later some went south to Minnesota. After 1810 the western posts were linked to the British bases on the Oregon coast. By mid-century the HBC ruled an inland empire that stretched from Hudson Bay to the Pacific. The Carlton Trail became a land route across the prairies. HBC land claims were transferred to Canada by the Rupert's Land Act 1868. From 1874 the North-West Mounted Police began to extend formal government into the area. The fur trade routes grew obsolete from the 1880s with the coming of railways and steamships. Several factors led to the end of the voyageur era. Improved transportation methods lessened the requirement for transport of furs and trading goods by voyageurs. 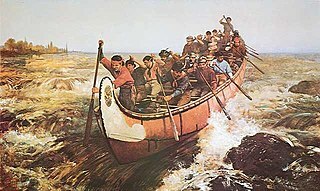 The presence and eventual dominance of the Hudson Bay York-boat-based entry into the fur trade areas eliminated a significant part of the canoe travel, reducing the need for voyageurs. Completion of the Canadian Pacific rail line in 1882 finally eliminated the need for long-distance transportation of furs by voyageurs. Also, the amount of North American fur trading declined, although it continues to this day. Fur animals became less plentiful and demand for furs dropped. Also, products such as silk became extremely popular and replaced beaver fur, declining the fur trade further. With the completion of the railway and the closure of Fort William as a rendezvous point both occurring in 1892, that year is considered by some to mark the end of the voyageur era. Later on, many French Canadians stayed in the bush with the prospecting and mineral exploration trades that grew from the middle of the 19th century into viable industries, especially in Northern Ontario. Nonetheless, they voyageurs enjoyed one prominent revival in the minds of the British Public - in the end of 1884, Field Marshal Garnet Wolseley was dispatched to Khartoum to relieve Major General Charles George Gordon, who was presently besieged by the islamist Mahdist movement. Wolseley demanded the services of the voyageurs, and insisted that he could not travel up the Blue Nile without the voyageurs to assist his men as river pilots and boatmen. The demand to use the voyageurs however, slowed down the British response, and ultimately the relief of Khartoum came two days too late. The voyageur's routes were longer distance fur trade water routes that ships and large boats could not reach or could not travel. The canoes traveled along well-established routes. These routes were explored and used by Europeans early in the history of the settlement of the continent. Most led to Montreal. Later many led to Hudson Bay. Hudson Bay and Montreal routes joined in the interior, particularly at Lake Winnipeg. In 1821 the North West Company and the Hudson's Bay Company merged. This resulted in a shift towards using the route with direct access to the ocean, the Hudson's Bay route, away from the Great Lakes route. Both shores of Lake Superior had been explored by the 1660s. By the late 17th century Europeans had wintered on Rainy Lake, west of Lake Superior, and by the 1730s regular routes led west of Lake Superior. Montreal was a main origination point for voyageur routes into the interior. The eastern end of the route from Montreal divided into two very different routes. The main trade route from Montreal went up the Ottawa River and then through rivers and smaller lakes to Lake Huron. The other followed the St. Lawrence River and Lake Erie to Lake Huron. Grand Portage (now Minnesota) on the northwest shore of Lake Superior was the jumping-off point into the interior of the continent. It started with a very long portage, (nine miles) hence its name. The North West Company moved its rendezvous point from Grand Portage slightly farther east to Fort William in 1803. In the late 18th century, Fort William, (currently Thunder Bay, Ontario) supplanted Grand Portage. The trunk from Grand Portage followed what is now the US/Canada border, and, in fact, the border was largely defined by that route. The route from Fort William was slightly farther north. The two routes led to and joined at Lac La Croix. Each was a rendezvous point of sorts for the routes that reached into the interior. The other main trunk started at York Factory where the Hayes River empties into Hudson Bay. This trunk led to Norway House on Lake Winnipeg. Later, the downstream portion of this route was traversed by York boats rather than canoes. A significant route led from Lake Winnipeg west to Cumberland House on Cumberland Lake, a hub with routes leading in four different directions. Most routes ended at the limits of what could be travelled in a round trip from a major transfer point (such as Grand Portage) in one season. Their canoes typically were made from the bark of large paper birch trees stretched over a white cedar frame. There were several sizes available for use, two common sizes, the larger (approximately 36-foot (11 m) long) "Montreal Canoe" and the approximately 25-foot (7.6 m) long "north canoe". 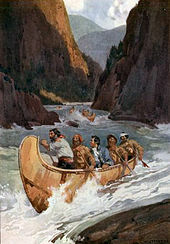 The Montreal canoe was used on the Great Lakes, and the north canoe was used on the interior rivers. The Montreal canoe, or canot de maître (master's canoe), was used on the Great Lakes and the Ottawa River. It was about 36 feet (11 m) long and 6 feet (1.8 m) wide, and weighed about 600 pounds (270 kg) and carried 3 tons of cargo or 65 90-pound (41 kg) standard packs called pièces. Crew was 6–12, with 8–10 being the average. On a portage they were usually carried inverted by four men, two in front and two in the rear, using shoulder pads. When running rapids they were steered by the avant standing in front and the gouvernail standing in the rear. The north canoe or canot du nord was used west of Lake Superior. It was about 25 feet (7.6 m) long and 4 feet (1.2 m) wide with about 18 inches (460 mm) of draft when fully loaded and weighed about 300 pounds (140 kg). Its cargo was half or less of a Montreal canoe, about 25–30 pièces. Crew was 4–8, with 5–6 being the average. It was carried upright by two men. The canoes used by Native Americans were generally smaller than the freight canoes used by the voyageurs, but could penetrate smaller streams. The express canoe was not a physical type, but a canoe used to rapidly carry messages and passengers. They had extra crew and no freight. The York boat was also used in the fur trade to travel inland on the Hayes River from York Factory on Hudson Bay, but was not necessarily manned by voyageurs. The York boat was only slightly larger than a Montreal canoe and could not be carried, but needed less crew, could be rowed, could carry more sail, was more stable on lakes, and was more durable. Voyageurs often rose as early as 2 am or 3 am. Provided that there were no rapids (requiring daylight for navigation) early in the day, they set off very early without breakfast. Sometime around 8:00 am they would stop for breakfast. Lunch, when it existed, was often just a chance to get a piece of pemmican to eat along the way. But they did stop for a few minutes each hour to smoke a pipe. Distance was often measured by "pipes", the interval between these stops. Between eight and ten in the evening, travel stopped and camp was made. Voyageurs were expected to work 14 hours per day and paddle at a rate of 55 strokes per minute. Few could swim. Many drowned in rapids or in storms while crossing lakes. Portages and routes were often indicated by lob trees, or trees that had their branches cut off just below the top of the tree. Canoe travel included paddling on the water with all personnel and cargo, carrying the canoes and contents over land (this is called portaging). In shallow water where limited water depth prevented paddling with the cargo in the canoe, but allowed either canoes or loaded canoes to be floated, methods that combined these were used. These moved the canoes via pulling by hand, poling, or lining with ropes. Circumstances where (only) an empty canoe can be floated through are called a decharge. Those where the cargo could be floated in the canoe if split into two trips were called a demi-charge. Furs were put into standard weight bundles known as pieces (bales) of 90 pounds each. The standard load for a Voyageur on a portage was two bundles, or 180 lb. Some carried more; there are reports of some voyageurs carrying five or more bundles and legends of them carrying eight. There is a report of a voyageur named La Bonga, a 6-foot-5-inch (196 cm) tall freed slave carrying 7 bales (630 lbs.) for one-half mile when applying to become a voyageur, a feat which trumped the usual requirement that voyageurs be short people. Danger was at every turn for the voyageur, not just because of exposure to outdoor living, but also because of the rough work. Drowning was common, along with broken limbs, compressed spine, hernias, and rheumatism. The outdoor living also added to the hazard of life and limb with swarms of black flies and mosquitoes, often kept away by the men sleeping with a smudge fire that caused respiratory, sinus and eye problems. Individuals wanting to rid themselves of the swarms that followed them often applied a Native America ointment made from bear grease and skunk urine. They preferred running the Dalles; they had not gone far, when to avoid the ridge of waves, which they ought to have kept, they took the apparent smooth water, were drawn into a whirlpool, which wheeled them around into its Vortex, the Canoe with the Men clinging to it, went down end foremost, and [they] all were drowned; at the foot of the Dalles search was made for their bodies, but only one Man was found, his body much mangled by the Rocks. When traveling, the voyageurs did not have time to "Live off the Land" by hunting or gathering. They carried their food with them, often with re-supply along the route. A north canoe with 6 men and 25 standard 90-pound packs required about 4 packs of food per 500 miles. A voyageur's day was long, rising before dawn and travelling before their first meal. Voyageurs typically ate two meals per day. Most of their diet consisted of a few items from a short list of food used for provisioning voyageurs. One was pemmican, consisting primarily of dried meat (pounded into small pieces) mixed with fat. Another was rubaboo or other dishes made from dried peas. It was more prevalent to include salt pork in the eastern routes. Montreal-based canoemen could be supplied by sea or with locally grown crops. Their main food was dried peas or beans, sea biscuit and salt pork. (Western canoemen called their Montreal-based fellows mangeurs de lard or 'bacon-eaters'.) In the Great Lakes some maize and wild rice could be obtained locally. By the time trade reached what is now the Winnipeg area, the pemmican trade developed. Métis would go southwest onto the prairie in Red River carts, slaughter buffalo, convert it into pemmican, and carry it north to trade at the North West Company posts. For these people on the edge of the prairie, the pemmican trade was as important a source of trade goods as was the beaver trade for the First Nations further north. This trade was a major factor in the emergence of a distinct Métis society. Packs of pemmican would be shipped north and stored at the major fur posts (Fort Alexander, Cumberland House, Île-à-la-Crosse, Fort Garry, Norway House and Edmonton House). C'est l'aviron qui nous monte en haut. To this day, school children learn this song as part of French Canadian culture. These songs served a dual purpose for the voyageurs. Not only would they be entertaining during long voyages but their rhythm would help synchronize their paddling. One fur trader, Edward Ermatinger, had the forethought to record some of these songs. This is how eleven voyageurs songs came to be known today. Ermatinger travelled for the Hudson's Bay Company from 1818 to 1828 as a clerk and learned these songs firsthand. These came to light only in 1943 when the Ermatinger family archives provided them to the Public Archives of Canada so that they may be copied. La Chasse-galerie, also known as "The Bewitched Canoe" or "The Flying Canoe," is a popular French-Canadian tale of voyageurs who make a deal with the devil in order to visit their sweethearts during the night, who are located a long distance away. It is a variant of the Wild Hunt. Its most famous version was written by Honoré Beaugrand (1848–1906). It was published in The Century Magazine in August 1892. More recently, the Quebec brewery Unibroue has incorporated a version of the legend into the name and artwork of its highly respected strong ale, Maudite ("Damned"). For voyageur-based fur trade, that main route was divided into two (occasionally three) segments, each traversed by a different set of voyageurs. Once or twice per year a larger gathering took place for the purpose of transferring furs and trading goods among these groups of voyageurs. The largest gatherings occurred at the largest such transfer points on the shore of Lake Superior at Grand Portage or Fort William. A rendezvous was also a time for rest and revelry. Due to the ages that most voyageurs began their careers, the majority of them were not married while they were working. Those who did marry would continue to work while leaving their family behind in Montreal. Few voyageurs are recorded as having married later in their lives in New France. There are a variety of explanations possible for this (including the higher than normal death rates for voyageurs and the opportunity to marry Native and Métis maiden at the rendezvous through local custom weddings). However, it is likely that many voyageurs left for Mississippi or settled in the Canadian West. ^ a b The Canadian Frontier 1534–1760 by W.J. Eccles University of Toronto ISBN 0-8263-0705-1 Published by University of New Mexico Press Albuquerque 1983 (revised addition) Original edition 1969, published by Holt, Rinehart and Winston Inc.
^ a b c d e f g h i j k Fur Trade Canoe Routes of Canada/ Then and Now by Eric W. Morse Canada National and Historic Parks Branch, first printing 1969. ^ Englebert, Robert. Diverging Identities and Converging Interests: Corporate Competition, Desertion and Voyageur Agency, 1815–1818. Manitoba History, 2007, 55, 2. ^ Englebert, Robert. Diverging Identities and Converging Interests: Corporate Competition, Desertion and Voyageur Agency, 1815–1818. Manitoba History, 2007, 55, 1. ^ Library jnd Archives Canada (LAC), Hudson's Bay Company Archives (HBCA), AlO/l, Governor and Committee General Inward Correspondence, Colin Robertson to London Committee, 17 January 1810, Microfilm 55. ^ Englebert, Robert. Diverging Identities and Converging Interests: Corporate Competition, Desertion and Voyageur Agency, 1815–1818. Manitoba History, 2007, 55, 5. Coppenrath Collection of Voyageur Contracts, Rare Books and Special Collections, McGill Library. Contains 52 voyageur contracts between 1800 and 1821. This page was last edited on 14 April 2019, at 17:09 (UTC).